As the best SEO company, Boca Raton we highly recommend learning how to navigate SEO best practices so you can improve your website, rank organically on search engines and gain subscribers. SEO is ingrained throughout a website, in its keywords, content and social media. Those are all opportunities to use keywords in your content. Done right, these keywords should highlight your message, your product, your services and your brand so that when search engine spiders—the software that crawls around the Internet, indexing websites and pages, based on their relevance to certain keywords—come to index your website you get ranked on the first page of a search. 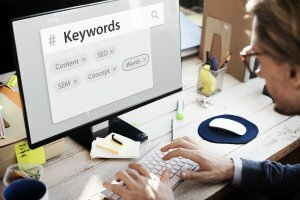 Here’s how to use keywords to boost your SEO game. Consider keywords to be the backbone of your SEO strategy—each keyword is a vertebrae. When people type their search term into Google the results they get and the order those results are in is based on how effectively those terms (aka keywords) are used throughout each site. To make sure your site organically ranks in the top results for searches relevant to your brand or product, choose your keywords carefully. Brands that don’t land on the first page of results when someone searches for the brand or product they produce can say goodbye to a tremendous amount of potential customers and target audience. Search engines find a website’s relevant keywords using a software tool, commonly called “spiders”. The spiders literally crawl through the Internet and index websites and pages based on their relevance, popularity and certain keywords. From the time you launch your website, you want to make sure that you have the right keywords and phrases throughout your text so you can compete with the hundreds, maybe thousands or millions, of other websites in your industry or market. If you have a website for your vintage car parts business and you publish a post covering the highlights of the Rolex Motorsports Reunion races, Google’s spiders will place your post in the search engine index bases on all of the relevant keywords you use in the title and throughout the body of the post, the keywords you tag the post with and the custom permalink you create for it (don’t use the default permalink if you want to boost SEO). This could include the keywords: “vintage car race”, “Monterey Classic Car Week”, “sports racing”, etc. Once the spiders have indexed the post, your blog will appear in search results for those terms. Analyzing the strength of keywords so that you choose the right ones help you move to the top of those search results. Want some help determining which keywords will keep you competitive online? Get in touch with the Best SEO Company, Boca Raton! We’re here to help.